for Richard Stands … . 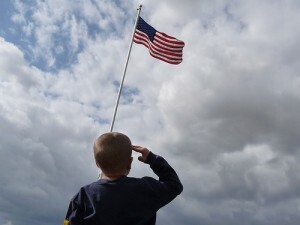 “Richard Stands” is one of the most common mishearings or misinterpretations of the words to the Pledge of Allegiance — and one of the best examples of a class of creative homonyms dubbed mondegreens. Mondegreen is a term coined by American writer and editor Sylvia Wright in a column for Harper’s Magazine (1954). Seems that Ms. Wright had misheard the last line in a favorite Scottish ballad – the line being “And laid him on the green” – as “And Lady Mondegreen.” The neologism stuck. When you perceive a word, lyric or phrase as another viable word or phrase — that’s a mondegreen. And the thing is, it may be years before you find yourself slapping your forehead and saying, “Oh, is THAT what it says? !” Mondegreens tend to be very personal, however several examples, especially in song, have achieved classic status. One more thing about mondegreen, the word. It’s been slow to be accepted by the dictionary police. It’s not in my Merriam-Websters Collegiate Dictionary – Eleventh Edition, but IS in the M-W 2008 update. Believe it or not; I really am a Richard Stands, a Junior in highschool actually. My father Richard Stands, Sr., passed away in 1958, during the civil war. We were very familiar with the â€œjokeâ€ on our name and did not mind it one bit. I donâ€™t know how many other Richard Stands are out there, Iâ€™m sure they may be some others, but none related to me that I know of.